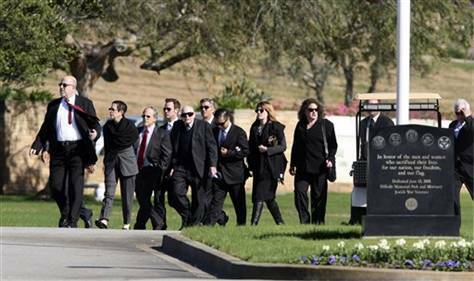 CULVER CITY, Calif. — Hundreds of Hollywood insiders gathered this weekend to pay tearful tribute to a publicist-to-the-stars, Ronni Chasen, who was shot to death as she drove home from a movie premiere. Some 500 people jammed Hillside Memorial Park's largest chapel near Los Angeles Sunday to pay respects to Chasen. Another 500 people were gathered on a wind-swept patio outside. The 64-year-old publicist was shot to death in Beverly Hills early Tuesday as she drove home from a party following a premiere and party of the Cher-Christina Aguilera film "Burlesque." Among those attending her service were Oscar-nominated singer-songwriter Carol Connors, producer Lili Fini Zanuck and Oscar-nominated film composer Hans Zimmer. Many of Hollywood's best known publicists also gathered to pay respects.